Greetings and beyond news fellow MIUI-ers. Hope y'all are having a great week so far. The weekend is coming in fast and most of you healthy MIUI-ers will probably be trying to break a sweat by hiking, walking, jogging and enjoying the outdoors in the process. The outdoors is truly a beautiful place and you should enjoy it while you can . If you need motivation to get going, I've got just the right thing for you. 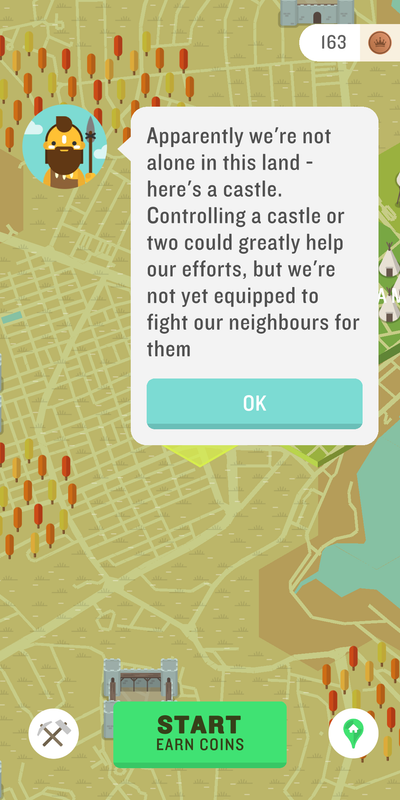 I give you Run An Empire — The Strategy Outdoors Game. Remember that history class lesson about prehistoric times? That's right, "online" didn't exist back then. People had to work really hard to thrive and that's how humans advanced from one age to the other. The game's story is such that it is the beginning of time and your people have been struggling through a terrible ice age for thousands of years. 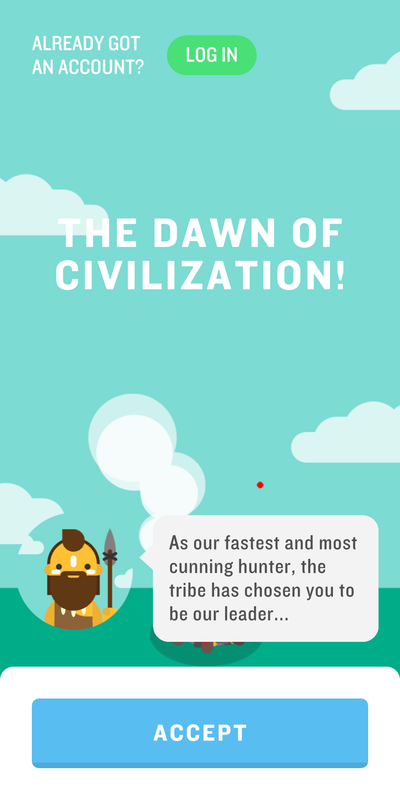 Lucky for you, you're the best hunter and since that ice is beginning to thaw, it is ushering a new age in which you've been chosen to lead your people from the prehistoric times to the peak of advancement. What other choice do you have than accepting this opportunity? You could always uninstall the game to take a permanent break but we don't want to do that yet do we? 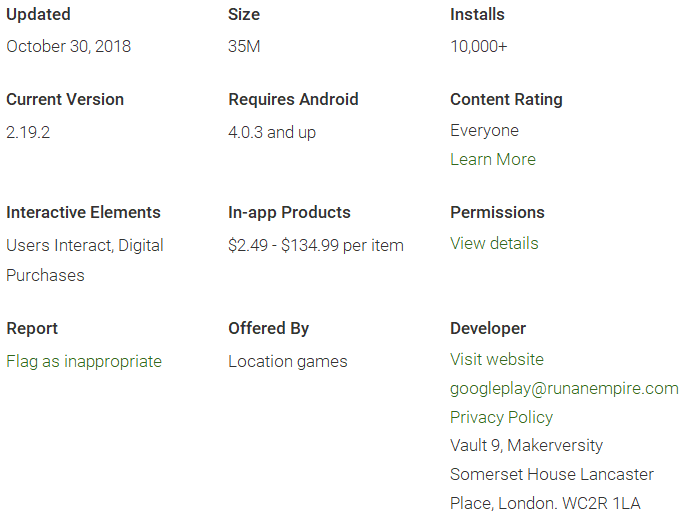 That's briefly an overview of what the game tells you on first launch. 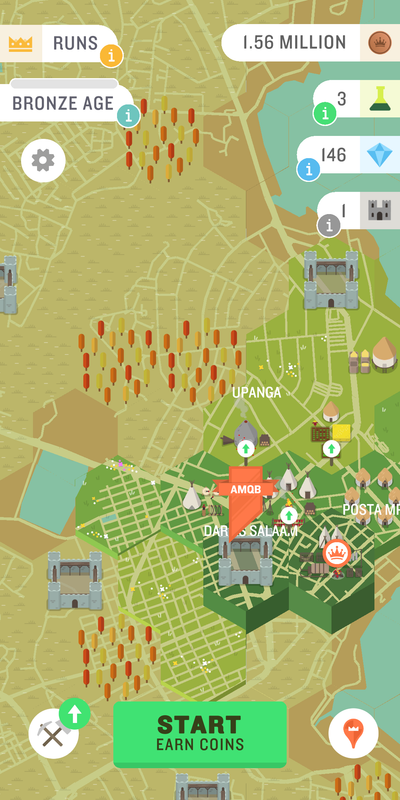 To the game itself, it takes advantage of AR (Augmented Reality) technology and relies very heavily on your phone's GPS and Internet Connection. Therefore, make sure you have enabled both. You're presented with a map of your current location. Wait a sec! That's not our ordinary map we see everyday is it? No Sirree! This world is made up of hexagonal tiles called "hexes" and you have to settle in so that you can start your work. 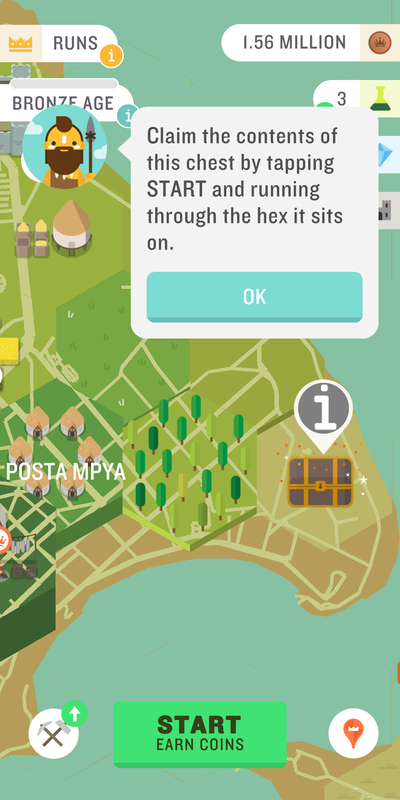 You need to choose a hex which will be your first settlement, followed by building an encampment (camp) for your hunters since hunting was the primary source of.. well.. everything way back then. This is where they will hunt from. You're also given a short introduction of the "districts menu which is your primary menu for building and customizing districts. You thought you and your people were all alone in this world? Think again. There are others out there as well who might not necessarily be good neighbors. You just settled into "a hex" but you're gonna need lots and lots of hexes to expand your great empire. No! You cannot bribe the officials for expansion. You need to get out there. Walk, run, cycle. Burn that fat! Hope you've got your trainers on as we're about to go on our first run. If you prefer, you can start and finish it without even moving a muscle and you'll be congratulated. We're all humans, and humans need rest. No need to worry though, you can build a granary in your district for automated money production. 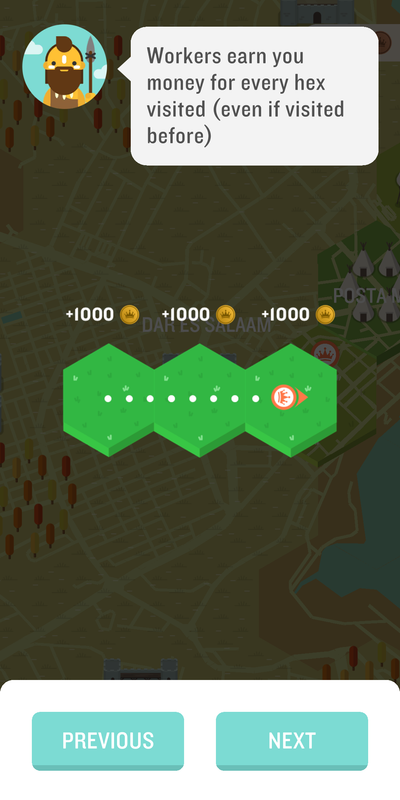 When you complete a run, you're given details about it including your route, hexes affected, distance covered (in kilometers, not hexes😉), duration of the run, calories burnt, average pace, gold earned per affected hex and it's total, as well as gems all with very beautifully animations. 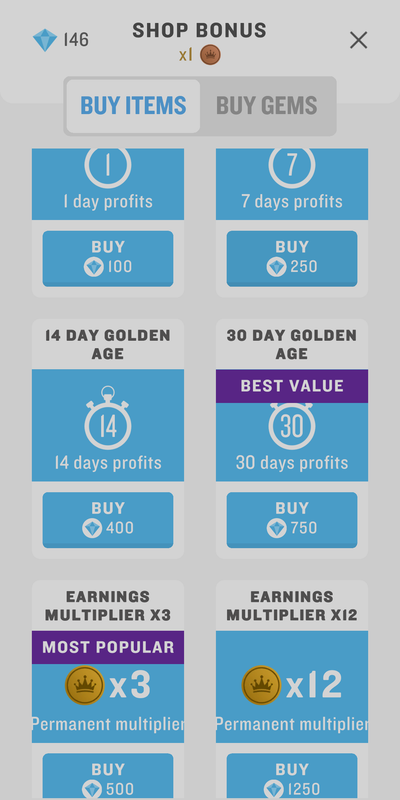 Gems, like most of free to play games which includes IAP (In App Purchases) allow you to take advantage of special power-ups such as gold multipliers and increased profits. These gems can be bought using real money or earned through hard work by walking and running. From my time playing this game, I found neither ant need to buy gems nor use them. As with most games, the gold you earned needs to be invested so that you can earn more gold. 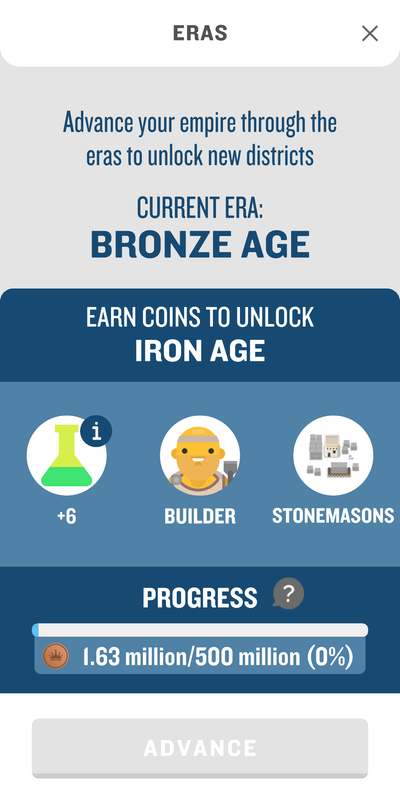 Gold is essential for building and upgrading districts, hiring hunters and farmers, as well as advancing through the ages to eventually reach the peak of advancement. Even then, the running doesn't stop 😎. 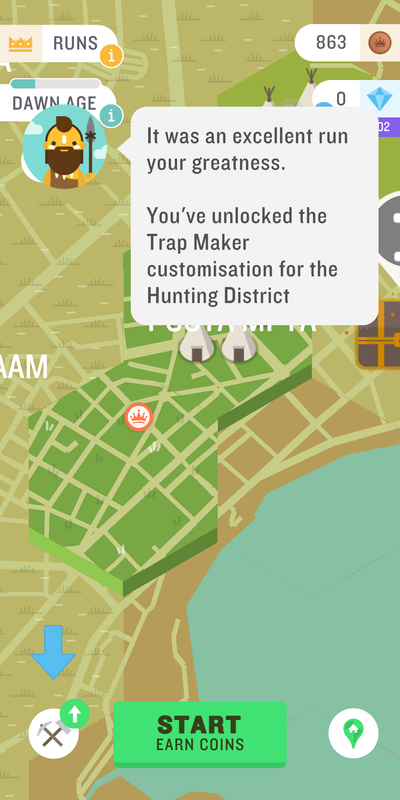 As you advance through ages, you unlock more and more districts and upgrades. This means there's a lot of running to do. Fear not, your empire can wait, but your (real) family need you to give them some time as well. This is perhaps why there's a "heart system" in place. Each run costs you a heart. As you play the game and continue advancing through the ages, you'll notice that the advancement requires a lot of coins, therefore make sure you get plenty of rest and replenish those hearts as well. 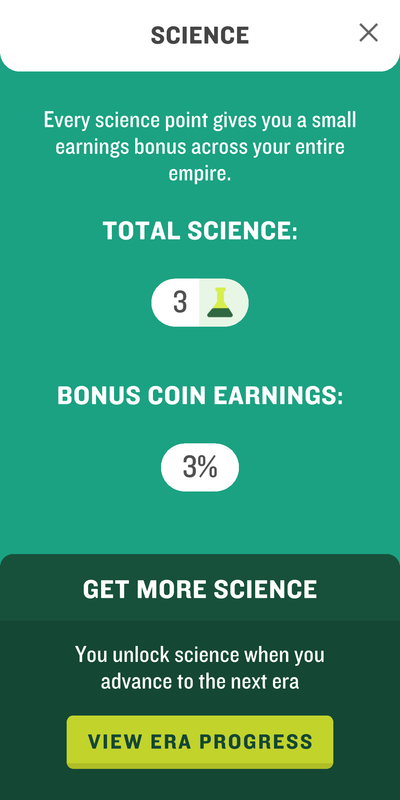 There is also what the game calls "science points" which in my opinion are like multipliers except that they don't reset. They keep increasing through advancement of ages giving you an earning bonus for your land. Well, you need to earn it by running through it/ around its area on the map. As you advance through ages, castles can be captured as well. But, as I said previously.. You're not alone in these strange lands. 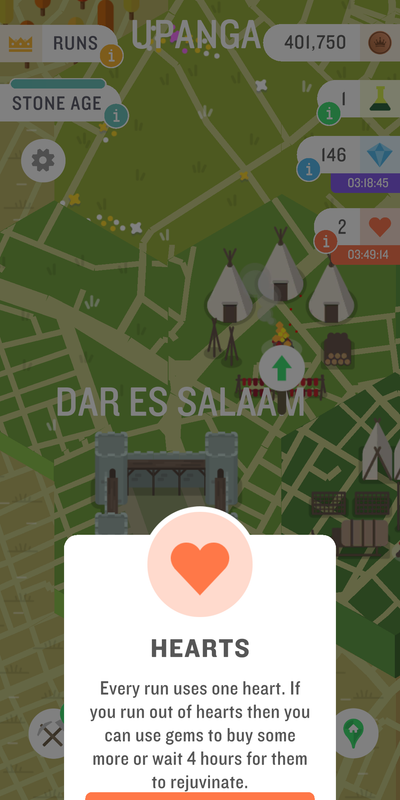 Castles can be captured by others as well, therefore you need to keep checking in on them every now and then to ensure your people don't overthrow you . You can sync your game's progress across multiple devices by either connecting your Facebook, or Google, or Strava account. This is great news indeed for users of Strava as your runs in the game should sync directly with your strava account . Doesn't require your phone's screen to remain on at all times. Excellent game to keep people healthy in the real world. Motivates you to work out even more. Keeps those thumbs healthy as well. Requires GPS to be active. Can become a battery drainer with constant usage. The developer has done an excellent job in my opinion to combat the problem that many people are facing, i.e. indoors gaming, sitting in front of that screen for hours in their spare time. This ought to be a huge motivator for such people for them to go and explore the outdoors. This is even better than using a plain old fitness tracker app in my opinion, as it offers you the fun of playing a game and a workout bundled into one package .